When you hear a knock at your door, you can usually guess who's on the other end. Perhaps a friend or a neighbor that's come by to say hi. Or maybe it's the delivery man with that package you've been waiting for. But one homeowner in Flamstead, United Kingdom, could have never expected what she would find when she got a knock at her door in the middle of the night earlier this month. After hearing the mysterious knock she opened the door to find a trembling white dog at their doorstep. 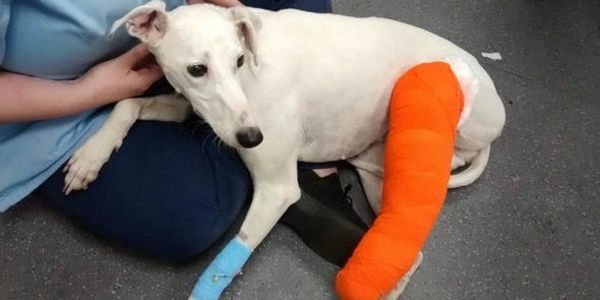 The dog — now named Snow White — is presumed to be a lurcher type breed and had a bone fracture poking through its fur on its hind leg and it was in terrible pain. Lurchers, also known as a "poacher's dog" have been traditionally used for just that, to poach. And after vets took a look at the dog's injuries they suspect the bone break was due to the dog being used for hare coursing — a cruel "sport" which uses dogs to chase down and maul and kill hares. The sport is illegal in the U.K. If vets are correct, it's quite possible that Snow White isn't the only animal that suffered as a result of her cowardly owner's actions. Officials say Snow White is a "sweet, gentle, friendly dog" and hope she will recover fully but the person who left her to suffer is still out there and quite possibly using more dogs to brutally kill more hares. Officials must take this seriously and work to find this criminal. If you agree, please add your name to the petition. Sign here and tell Hertfordshire police that you want justice for Snow White.